Once again, the back-to-school season has come and gone. High school and college students have settled into new routines, and recent grads have moved on to new roles. But an astounding 5.8 million teens and young adults between the ages of 16 and 24 are neither working nor in school. As their peers lay the foundation for a productive and meaningful adulthood, these disconnected youth find themselves unmoored from the structures that confer knowledge, skills, identity, and purpose. Just over a year ago, Measure of America published its initial research on the epidemic of youth disconnection called One in Seven. This report updates last year’s findings with the latest numbers and, to better map the landscape of youth disconnection, also presents the data by neighborhood cluster for each of the twenty-five most populous US metro areas. Boston (9.2 percent), Minneapolis (9.5 percent), and Washington, DC (11.3 percent) have the lowest rates of youth disconnection among the twenty-five most populous metro areas. Charlotte (17.3 percent), Detroit (17.4 percent), and Riverside–San Bernardino (18.8 percent) are home to the greatest share of disconnected young people. The greatest disparities are found not between but within our nation’s big cities. In Chicago, New York, and Detroit, gaps of approximately 30 percentage points separate the most- and least-connected neighborhood clusters. A chasm separates different racial and ethnic groups. In Pittsburgh and St. Louis, one in every four African American young people is disconnected, compared to one in every ten white youth. Nationwide, African Americans are roughly three times as likely as Asian Americans and twice as likely as whites to be disconnected in their teens and early twenties. In addition to painting a picture of youth disconnection in America today, in this report we imagine, in very specific terms, a different, better tomorrow. We lay out an ambitious but attainable goal: to halve the gaps between the most- and least-connected neighborhoods and between racial groups in half by 2030. Our research has convinced us that, through the collective efforts of educational institutions, social service delivery organizations, the justice system, the private and nonprofit sectors, and others, this objective is within reach. By coalescing around a shared goal, we can galvanize greater attention to the problem, mobilize more resources, and put in place a system of accountability for tracking our progress annually. What would it mean in practice to halve the gap? In Philadelphia, the African American youth disconnection rate is 25.2 percent, and the white rate is 8.9 percent, a gap of 16.3 percentage points; halving the racial gap would mean that no more than 8.15 percentage points would separate blacks and whites by 2030. 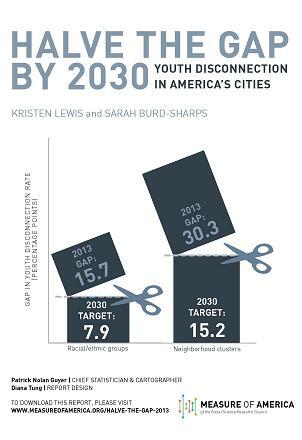 In terms of Philly neighborhoods, the highest youth disconnection rate is 30 percent, the lowest, 3.2 percent, a gap of 26.8 percentage points; halving the neighborhood gap would mean no more than 13.4 percentage points would separate any two neighborhoods by 2030. We firmly believe that setting measureable, time-bound targets for reducing youth disconnection is key to moving the needle on this critical issue. Knowing where you want to go is fundamental to getting there.